A grant to a community arts club resulted in a number of community benefits, including a sewing class. The club enjoys working with artists and crafters in the community to make sure that artistic skills are handed down to the next generation. A local high school girl mentioned that she would be interested in learning how to sew and was not able to take the course at school. A local artist had done some barn wood paintings inspired by patriotic red white and blue colors and quilting block design. An idea emerged to combine a sewing project with quilting in an event for Flag day. 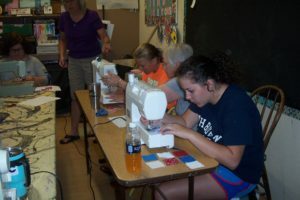 Workshop students would make an oven pad from a 9-block quilting pattern, working on sewing machines to do the quilting. Volunteers brought sewing machines for the class to use and assisted the participants. This was an ambitious project for beginners, but all of the students worked diligently to create works of art that they could be proud of. The participants were exposed to the techniques of how to thread a sewing machine and work controls like the tension knob and the foot pedal. They were able to select the colors and patterns they wanted to create a unique oven pad of their own design. The workshop was offered free to the public. Participants were happy to learn a new skill that they could pursue in the future. The class participants represented up to three generations of family members!